The program has previously been used online as it requires the school settings. You are the last user of the program on that computer and you have selected your username. You have entered the correct password. 1. Select your username and enter your password as normal but do not click Login. Click the 'Options' button. 2. 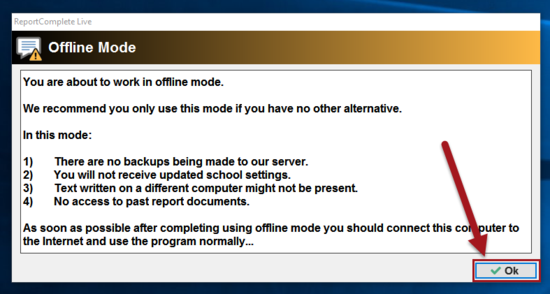 Now click the 'Offline mode' button at the bottom of the extended login window. 3. The program will now load in any report data that was previously stored on your computer. Once this has been done you will be shown a caution window, click 'ok' after reading it. You should reconnect your computer to the Internet as soon as possible then use the program normally. This will send the data you have entered whilst offline to the server. What happens to my reports if whilst using the program normally I lose my Internet connection? ReportComplete will detect this and save your data locally until the next time it can reach the Internet. Just continue to use the same computer and the next time you use the program it will upload the data as normal. This page was last modified on 21 March 2016, at 13:09.